Tomato Patch: Pinch that Sucker? I am a sometimes sucker pincher. Sometimes I pinch them. Sometimes I don’t. Every year I vow to pinch them, but usually I pinch them early in the season and forget about weekly followup. You’re reading something that indicates Tomato Patch in the headline, so you know suckers must have something to do with tomato plants. But just what are they? 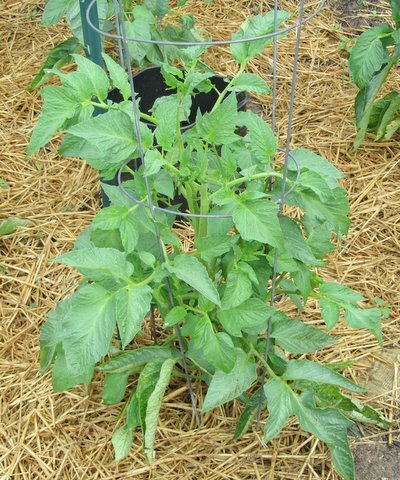 Suckering is important on indeterminate tomato varieties—the “tall” plants that continue growing until frost kills them. 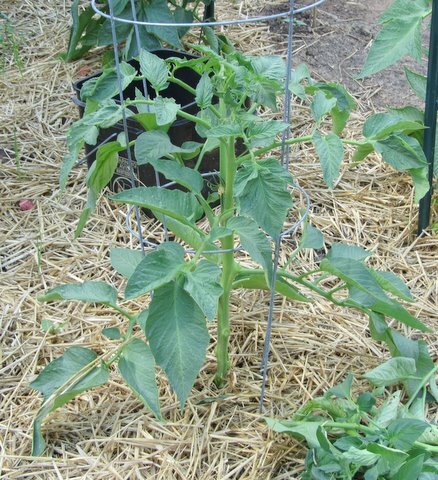 By definition, determinate, or “short,” varieties are limited in their growth, have few suckers, and will not leave you groping for sunlight in an overgrown jungle of tomato leaves. Pinch the suckers when they’re young and tender. Just snap them off with your fingers. The “wounds” will heal quickly. However, the stems of suckers become tougher as they age and may not come off as cleanly with your pinch. That’s when you may need to use your pruners or scissors, though some sources say their use may introduce pathogens to cut tissue. Some sources emphasize pinching of lower suckers because they usually are shaded by higher leaves and usually produce little fruit. Another reason is that leaves closer to the ground are at higher risk of diseases that are endemic in local soils that can splash onto lower stems during rain or watering if plants aren’t well mulched. How many suckers should you pinch from each plant? Intensive growing systems, such as Mel Bartholomew’s “Square Foot Gardening,” recommend that you remove all suckers. For general gardening situations, the consensus seems to be to let one or two suckers grow, so each becomes a leader with leaves, flowers, and fruit of its own. This year I’ve vowed once again to pinch suckers weekly. I started Friday, perhaps two weeks behind schedule. Some of the suckers already were a foot long, and when I pinched them, sometimes they pulled small strips of tissue from the main stems. That’s a good reason and also a reminder to pinch suckers when they are young and tender. 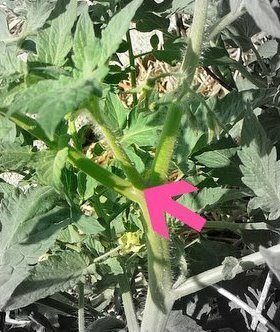 Photo 1 shows a sucker growing in the axil where tomato stem and leaf join. Photo 2 shows one of my Brandywine Red plants before I pinched suckers. Photo 3 shows the same Brandywine Red after I removed all the extra growth. The difference is remarkable—sort of like when I get a haircut after four or five weeks. Since I was doing “catch-up pinching,” it took nearly an hour and I carried an armload of pinched suckers from my Tomato Patch. But if I pinch regularly, future maintenance will be both quick and minimal. Here are two short videos that will show you how to pinch suckers. To watch Jon Traunfeld of the University of Maryland Extension in “Pruning Tomato Suckers” (3:17 minutes), CLICK HERE. To watch Johnny’s Selected Seed video, “How to Prune Tomatoes (2:52 minutes), CLICK HERE. As a side note, if your worried about diease spread, just sterilize your pruners or pinchers. This can be done with a bleach solution or in the case of pruners, fire from a propane torch. I'm embarrassed to admit that I've never used a bleach solution or a propane torch to sterilize my pruners, scissors, or — fingers. Bad Bob. Good article, I let the suckers grow and determine if it is truly a leaf sucker of a flowering stem. I only pinch the leaf sucker. I also keep a Q=tip handy and brush the flowers to insure pollenation. Two good moves, Bud. Many gardeners just gently tap the flowering stalk to assist in the pollination process. But a Q-tip should work as well.